Advertising your brand name does not necessarily have to be as complicated as it was a few years ago. With new innovations and technological updates, it has reached new levels which offer a variety of benefits for business-owners. However, admittedly, every brand owner wants to make their company stand out in the crowd, and that is why, in this day and age, you need something new to make your business look more appealing. Vehicle graphics, in this regard, is an amazing idea. It helps to catch the attention of a wide audience while also maintaining reasonable rates in the process. Vehicle graphics, including the very popular truck graphics, are unique, affordable and effective. Wherever you travel, your brand name and image goes with you. Hence, you can touch upon new areas every day and reach out to new people every day. 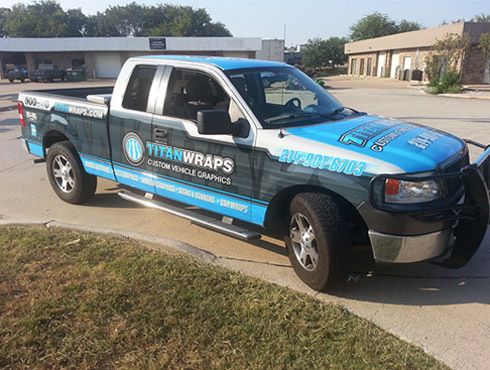 If you also need such an advertising tool for your business,then we at Titan Wraps can be your perfect match. We offer quality products which are durable as well as aesthetic and that is why we have been consistently developing our name in locations like Carrollton TX, Dallas TX, DFW, Frisco, Lewisville TX and Plano TX. As a business-owner, you must be aware of the competition that your company receives. So, if you want your vehicle graphics to have the most desired effect, you must make it unique. Take a look at what your competitors are doing to gauge how you can make yours even better. Try to make something different and one-of-a-kind so that your advertising reaches out to more people. Although graphics make your brand name look for enticing and exciting, it is possible to go overboard during the whole process. Since a lot of color and style choices are available, make sure that you do not get overwhelmed and only purchase what you need. If you need more assistance on the subject, call us at 214-901-6703 today!